It then switches to a wide shot of the Benatar drifting in deep space. Alone, with nothing left. 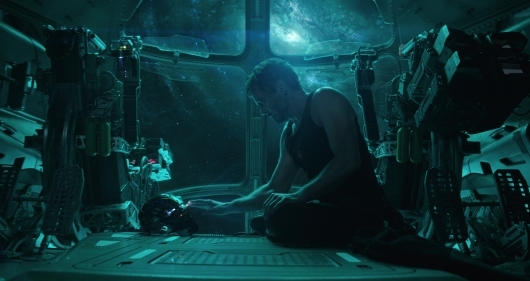 “Part of the journey is the end,” Stark foreshadows. “Just for the record, being adrift in space, with zero promise of rescue is more fun than it sounds.” He then goes on to tell how dire the situation is with no food or water aboard the ship, and oxygen could run out in the morning. But he says that when he does drift off, he will dream about her. Shots of the Avengers base is then seen with Cap and Bruce still in mourning after such a devastating loss. But two holograms of Ant-Man and Spider-Man appear. “We lost. All of us. We lost friends. We lost family,” says Cap. With a shot of Hawkeye, in a Ronin suit, wiping the blood off sword with his arm. “We lost a part of ourselves,” Cap continues. Seeming to hint at Clint’s loss of his own family and the rage he went through when they turned to dust. That’s just speculation on my part. “This is the fight of our lives,” Cap says. “This is going to work, Steve,” says Black Widow with an assuring tone. “I know it is. Because I don’t know what I am going to do if it doesn’t,” Steve says with an unsure tone. It then closes out with the new Avengers: Endgame title. Oh, and it didn’t end there. But you might need to buzz Scott Lang (Paul Rudd) into the Avengers base. You are going to need all the help you can get if you want to beat Thanos. And just as the poster tells us, Avengers: Endgame gets a brand new release date. It opens in theaters on April 26, 2019.